Top 10 in 2012 - C.R.A.F.T. I thought it would be fun to share some blog deets. Last year, I posted the top 10 C.R.A.F.T. posts of 2011 + blogging lessons learned. 4 of the posts from the 2011 list also made the 2012 list… pretty amazing! It’s clear y’all like round ups (and so do I)! Here are the top 10 most viewed posts on C.R.A.F.T. in 2012. 1: DIY Adult Halloween Costumes (2.4 million pageviews) *This is the 1st post I ever turned off commenting on. It was way out of hand. After all, it’s only Halloween! 3: 29 DIY Kid Halloween Costumes (759,000 pageviews) *This is the 2nd post I turned off the comment feature. Apparently, kids halloween costumes are very controversial. If you a minute or 30, feel free to weigh in on the kid halloween costume debacle! 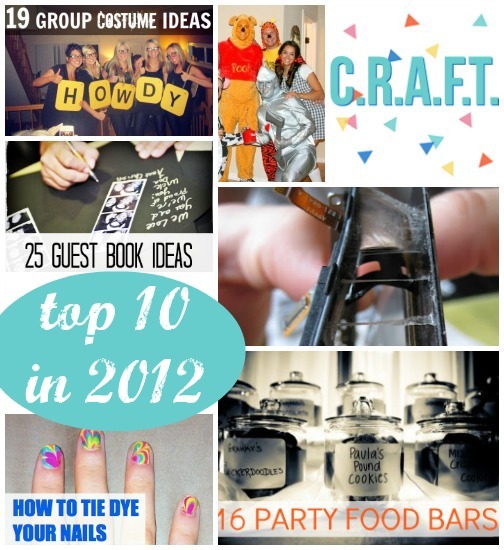 4: 16 Party Bar Ideas (674,000 pageviews) *This is one of my favorite posts! I love party bars or food stations or whatever you want to call ’em! I love that people continue to leave awesome ideas for food stations in the comments! 5: 59 Hand and Foot Print Projects (176,000 pageviews) *I love long lists of awesome ideas. All kids have hands and feet, and here are 59 ways to make ’em into art! 6: 20 Unique Pumpkin Ideas (143,000 pageviews) * This was #1 on the 2011 list. I made a 2nd post with 21 more pumpkin carving ideas because this one was such a hit! 7: Group Costume Ideas (104,000 pageviews) *Clearly Halloween is a big thing around here! 10: How to Tie Dye your Nails (82,000) *This was #4 on the 2011 list. I have to give Annie a shout out for this post. After all, they are her nails and she found the great idea! Can’t wait to see what you are cooking up! I’d love you to come link this up at my Best of 2012 Party. Impressing numbers! Great and helpful posts…good job.